Rowe Ridge Vineyard & Winery, the first vineyard in Wyandotte County, KS, is just north of the Kansas Speedway, Sporting Kansas City Stadium, and the legends shopping area. Located one mile west of I-435 on Leavenworth Road, the vineyard and winery are easy to find. Owners Marc and Pamela Rowe planted the first vines in 2005. The vineyard is now five acres with approximately 3000 vines. 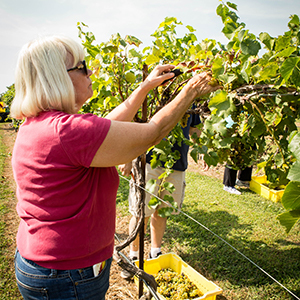 We grow 9 varieties of hybrid and American native grapes. Originally locate in a rural area, the popularity and development of the area has surrounded the vineyard and winery with homes. The first Rowe Ridge wines were made in 2007 but the tasting room wasn’t built in 2012. Currently 10 wines are available for sampling. The list includes 5 estate grown aged, dry wines as well as 2 fruit wines. In the summer wine slushies and sangria are featured and mulled wines in the fall. The vineyard is visible from the tasting room deck were visitors can relax and enjoy a glass of wine. The deck and tasting room are handicap accessible via a lift on the west side of the deck in the covered patio area. Visitors are welcome to taste Rowe Ridge wines and browse the tasting room gift shop, stroll through the vineyard and fish in the vineyard pond. Wine flights are $8.00 and include six to eight wines and a souvenir logo wine glass to take home. Owners Marc and Pamela are available most days to lead vineyard tours and answer questions on grape growing and wine making. Groups are welcome and the parking lot can accommodate large buses. Please make reservations for groups of 6 or larger. The winery is open noon to 5pm Thursday, Friday & Saturday and Sunday. Other times are available by appointment. Call 913-721-9776 for an appointment.